American Express have been putting on some decent offered recently, including a £100 rebate for spending £500 with British Airways, and a £50 rebate for spending £200. An offer has just popped into my inbox offering a bonus 7,000 Avios if I spend £7,000 between now and the end of July. Now, given that the standard rate is 1.5 Avios / £, this bonus is equivalent to 2.5 Avios / £ which is great, as long as you are going to hit the target. If you have some big purchases coming up in the next two months, this is a good little bonus to take advantage of. 1. Bonus Avios. 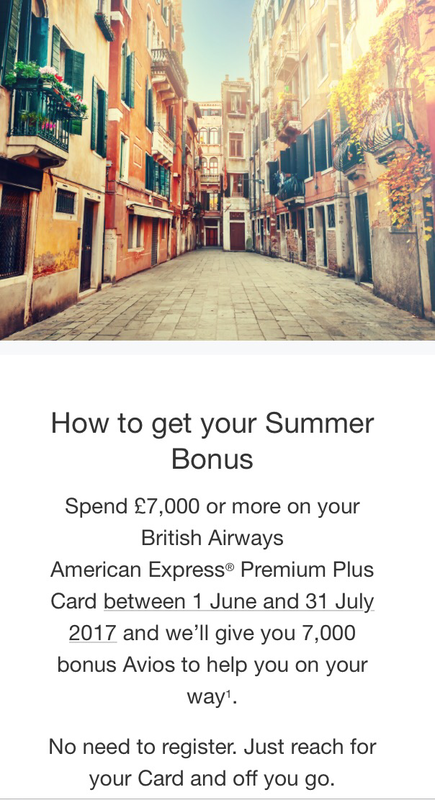 For the British Airways American Express Premium Plus Card, 7,000 bonus Avios will be awarded to your Account once you have spent and been charged a minimum of £7,000 on goods and services to the Account within the campaign period from 1 June and 31 July 2017. Please note, bonus Avios will be credited to the Cardmember’s Account once the spend requirement has been met. In rare circumstances it may take up to 6 weeks from the campaign end date for the bonus Avios to be applied. Firstly, I have just got the AmEx Gold card through which I intend to spend at least £2,000 to trigger the 22,000 membership rewards points – diverting spend to the BA AmEx just doesn’t make sense. Secondly, if I met the target I would also trigger my 2for1 voucher which I don’t like to do until as late as possible if I have no redemption planned as it otherwise shortens the window in which I can use the voucher as It shortens the window in which I can use the voucher. It is a nice offer from AmEx, and I hope that some of you might be able to take advantage!